South Pacific combination of the Pacific Resort Rarotonga, stretching one kilometre along the south-eastern coast of Rarotonga, Muri beach is laden with glorious white sand, fringed by palm trees and lapped by the gentle waters of a shallow, safe lagoon. A short flight to the Pacific Resort Aitutaki, limited to just 27 luxurious absolute beachfront bungalows, suites and villas, all with their own personal, panoramic view of Aitutaki’s world-famous lagoon and where each sunset majestically colours the ocean beyond. Receive a traditional Lei greeting on arrival before being transferred for your early check in to the Pacific Resort, Rarotonga in a Garden Suite. Accommodation - Nestled discreetly on the white sands of Rarotonga’s most spectacular lagoon, this 64 room boutique resort offers a perfect blend of modern comforts and traditional island hospitality. A place where simple, lazy days meet luxurious evenings. Where slow-paced island life meets fast-paced nightlife. And where the friendly, gracious staff meet your every request. This is a place where you can bury your toes in the sand, or bury yourself in activities. Where you can lie in the sun, or lie in bed all morning. Where you can dance into the night on the beach, or watch the locals dance in the villages. 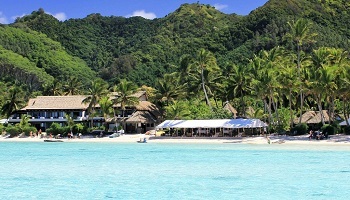 As you’ll discover, Pacific Resort Rarotonga is situated in one of the world’s most spellbinding spots. Stretching one kilometer along the south-eastern coast of Rarotonga, Muri beach is laden with glorious white sand, fringed by palm trees and lapped by the gentle waters of a shallow, safe lagoon. And the resort itself is equally scenic. Set in six acres of lush tropical gardens, surrounded by breath-taking views and majestic mountains, Pacific Resort Rarotonga features elegantly appointed accommodation, authentic Polynesian architecture and a stunning tropical setting. 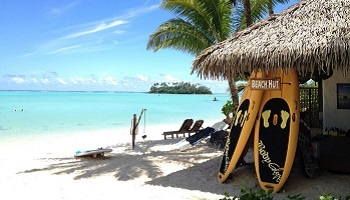 This morning you will be transferred to the airport for your flight to Aitutaki. 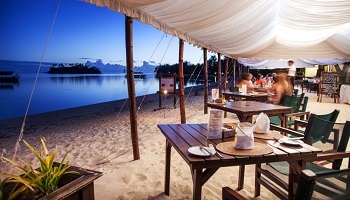 Once arrived you will be transferred to your resort for your first night at the Aitutaki Beachfront Bunglaow. Enjoy a final day of leisure at the Beachfront Bungalow before a late night check-out and transfer to the airport for your flight to Rarotonga and connecting flight to the US. Welcome Back to Los Angeles!.